The Suessiones were a Belgic tribe of western Gallia Belgica in the 1st century BC, inhabiting the region between the Oise and the Marne, around the present-day city of Soissons. Caesar describes the Belgae as going to Britain looking for booty: "The inland part of Britain is inhabited by tribes declared in their own tradition to be indigenous to the island, the maritime part by tribes that migrated at an earlier time from Belgium to seek booty by invasion. 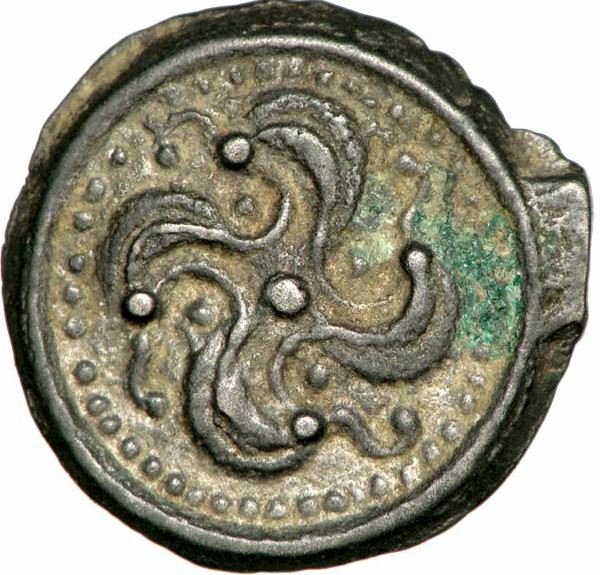 ..."
Coinage minted by Belgic Gauls first appeared in Britain in the mid-2nd century BC, and coinage minted by the Suessiones have been found from Sussex to the Wash, with a concentration of finds near Kent.